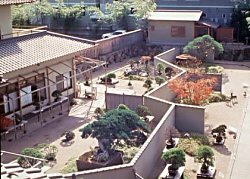 This Bonsai Museum in Obuse near Nagano, has an incredible collection of masterpieces, and Mr. Shinji Suzuki changes the arrangement of the plants daily so that each visit to the museum becomes a new experience. The display area is successively divided in five sections which represent the different landscapes of the Japanese spirit, which is to say: the spirit of the Nordic wood of Hokkaido, the land of the big mountains of Shinshu, the famous Fukayama Valley in Tohoku, the unforgettable landscapes of Irifune in the Japan Sea and Miyabi, the ancient capital. The bonsai is part of a big building where a restaurant, a bar and a hotel are included & next to it You can enjoy the works by artists associated with the Shinshu region in the Shiki Art Gallery. Entrance fee: adult 600 yen, junior high school student 400 yen, Open 9 a.m. - 4 p.m., closed on Mondays and Tuesdays, the year-end & New Year holidays.